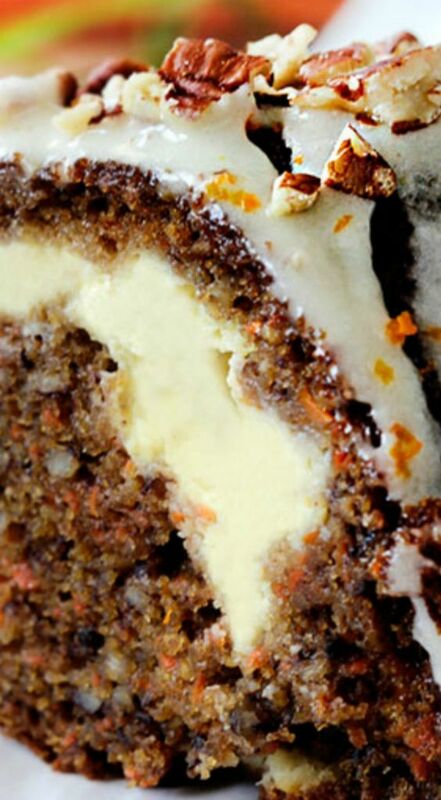 Super moist, spiced Carrot Cake stuffed with sweet cream cheese filling and drizzled with sweet and tangy Orange Cream Cheese Glaze that will have you drinking it straight from the bowl. So I really love you guys. I made this cake 3 times this week (not counting the time I forgot the flour – its been that kind of week), to create the perfect carrot cake that’s super moist without being oily, spiced to perfection with hints of orange, and with a surprise sweet cream cheese fill. To make the Cream Cheese Filling, beat the cream cheese and sugar until light and creamy. Beat in remaining Filling Ingredients until smooth. Set Aside. In a large bowl, mix all of the Dry Ingredients together. In a separate bowl, gently whisk eggs then stir in remaining Wet Ingredients just until combined. Don't overmix. Stir Wet Ingredients into Dry Ingredients just until moistened, then stir in 2 1/2 cups grated carrots until evenly combined (I use my clean hands to stir in the carrots). Spoon 3 cups batter into prepared bundt cake pan. Spoon Cream Cheese Filling over batter and gently smooth, but do not touch the sides of the pan. Top with remaining batter. Bake at 350F degrees for 45 minutes, cover with foil then reduce heat to 325 and bake an additional 25-30 minutes or until toothpick inserted near the center comes out clean. Cool in the pan for 10 minutes then transfer to a cooling rack to cool completely. To make the Orange Cream Cheese Glaze, using an electric mixer, cream together all of the Glaze ingredients EXCEPT the powdered sugar on medium speed for 1-2 minutes or until completely smooth. Add sifted powdered sugar and beat until very smooth, scraping down sides as needed. Place the frosting in the refrigerator for 5 to 10 minutes before using. When cake has cooled, drizzle Glaze over cake or individual servings, whisking in additional orange juice/milk if Glaze has become too thick upon standing. *To easily shred carrots, use the grater on your food processor. If you don't have the grater blade, you can also finely chop in your food processor. **When "flouring" my pan, I use cocoa powder instead of flour because the cake is brown. 0 Response to "CREAM CHEESE STUFFED CARROT CAKE WITH ORANGE GLAZE"